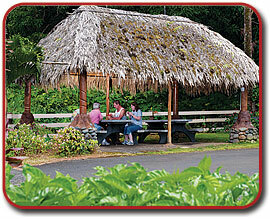 For almost 30 years, Halfway to Hana had been a scheduled stop on the Road to Hana for visitors and residents alike. Owners, Doug and Nita Chong have created a tropical oasis on farmland that has been in the Chong family for over 150 years. Halfway to Hana started as a simple lean-to on the side of the road selling shaved ice and has grown into a north shore favorite for snacks, refreshments, friendly directions and other services including an ATM. For many years, the only pay phone in the area was at Halfway to Hana. Nita bakes her famous Banana Bread daily using home grown bananas and other ingredients supplied by the local agriculture community. Born and raised on Oahu, Doug is a retired law enforcement officer, avid hunter, and outdoorsman. You are welcome to view the boar head collection behind the fruit stand. The property includes an authentic thatched roof "Hale" where you can relax in the shade and enjoy a great lunch or cold drink and maybe some coconut candy. Doug and Nita have 4 children and 16 grandchildren. They invite you to stop in at Halfway to Hana because you haven't experienced the Road to Hana unless you've made it at least Halfway.